For a window into how legislation is made, few moments were more educational than a sparsely attended meeting Tuesday afternoon in a cavernous, mostly empty room on the University of New Mexico campus. On the surface, the meeting was congenial as two state lawmakers, legislative staff, attorneys and representatives of civic organizations hammered out the beginnings of draft legislation that would fill out the details of the state’s first independent ethics commission if voters give the go ahead in November. But beneath the amicable discussions there was a rematch of sorts, perhaps noticeable only to those aware of the contentious history surrounding the idea of an independent ethics commission. For almost 15 years, lawmakers offended by the notion that they needed anyone to watch over them squared off against other legislators who touted independent oversight as a way to restore public trust in government. Legislative opposition knew no political party, with both Democrats and Republicans chafing at the idea of an independent oversight body. Year after year, the opponents won even as political scandals took down prominent figures from both major political parties, until 2017, when supporters finally achieved their goal. But the win came with last minute-drama involving the two state lawmakers at Tuesday’s meeting: Democratic state Sen. Linda Lopez and Republican state Rep. Jim Dines, both of Albuquerque. It was the Senate Rules Committee, chaired by Lopez, that late in the 2017 legislative session voted to remove language from the ethics commission legislation sponsored by Dines, and others, that made ethics complaints, commission hearings and responses public. Also removed was who would appoint members to the commission, but that piece was added back later in the legislative process. Should the measure win voter approval in November, setting up the commission will fall to Lopez, Dines and their legislative colleagues, with input from the next governor, during the 2019 legislative session. Which gets us to Tuesday’s meeting. 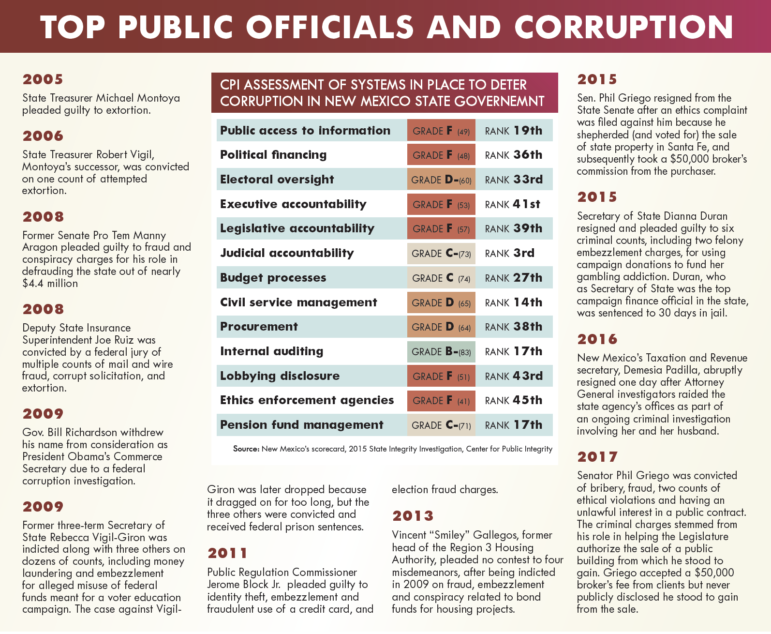 The working group, which in addition to Dines and Lopez included representatives from Common Cause New Mexico, New Mexico First, the League of Women Voters, New Mexico Ethics Watch and the New Mexico Sentencing Commission, expects to meet several times between now and January in the hopes of producing ethics commission legislation that anticipates many lawmakers’ concerns. And there are good chances the group in upcoming meetings will re-litigate language removed by Lopez’s committee in 2017. Tuesday’s discussions were dense, even arcane, with regular digressions into the state’s legal codes. One focused on what a “state agency” is, and what it means in the working draft. People in executive and legislative agencies would fall under the purview of the ethics commission based on how “state agency” is defined in the current draft. But it is unclear whether employees of public school districts or the New Mexico Spaceport Authority would be. Those are open questions, requiring additional research. Also up for discussion was whether to make the threshold for taking action four or five votes by commission members. The draft proposed five. But a member of the working group wondered if four was a better threshold for routine business and five for more substantive issues. These are some of the easier questions. Still to come are discussions over the standards of evidence the ethics commission would use and the issue of funding. Funding is a fraught issue for an independent body that watches over people who determine its annual financial fate through the state budgeting process. In some states, lawmakers perennially underfund such watchdog agencies, creating toothless ethics commissions. Recent drama in Wisconsin surrounding a decade-old ethics agency highlights the danger of a watchdog agency antagonizing those who control its pursestrings. In that state, ethics commission-launched investigations into state leaders led the Legislature to shutter that agency and create another entity. The working group will take up these and other questions in the coming months. The next meeting will be the afternoon of Oct. 18 at University of New Mexico Science & Technology Park Rotunda, 851 University Boulevard SE, Albuquerque. Once the draft ethics commission legislation is ready, the proposal will undergo another vetting process during the 60-day legislative session, where dozens of state lawmakers curious about its power and purpose, including Lopez if history is any indicator, might demand changes to the legislation. For New Mexico voters, the primary sources of campaign finance data are the websites of the New Mexico Secretary of State and the Federal Election Commission. And at the federal level there are also reports filed by broadcasters with the Federal Communications Commission that show who is buying airtime for television ads.